Monica Fimbrez began teaching for Music Together® of San Francisco in 2006 after graduating from San Francisco State University with a BA in Music. Her career focus revolves around performing and in community healing through the arts. Monica is a songwriter and lead vocalist for her band, Soul y Agua, and she plays jarana, guitar, bass and percussion. 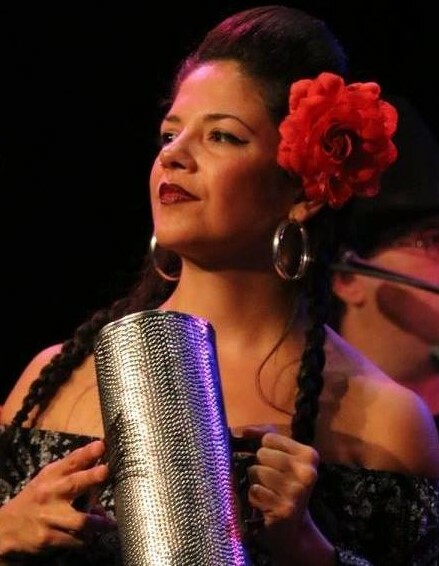 Monica frequently performs locally in the Latin & Folk genres, and has played in venues such as Yoshi's Oakland & San Francisco, Brava Theater, the Red Poppy Art House and the Mission Community Market. She has been honored to share the stage with artists such as John Calloway, Jesus Diaz, Anthony Blea, John Santos, and Alfredo "El Godo" Herrera. One of the reasons Music Together is so special to Monica is that it allows her to combine her love for music, community building and for inspiring children. "Many families tell me that the main reason they love my class is because of my nurturing and calming energy. As much as we are in class to give the children a musical experience, I also very much acknowledge each child regarding their individual social and gross motor development. I am first and foremost patient and warm with the children. I like to encourage the families to think of music class as a means of community building where people can come together to enjoy music as a way to connect with and enjoy each other, and the musical development of the children in turn should be a natural by-product of their exposure to a musical community. I believe children learn through osmosis and that music class should primarily be a place where they can build a positive relationship with music through building great memories around it. A positive association with music will cause them to seek it out on their own. We do small movements in class that are intended to help children develop their fine motor skills as well as large movement activities that give them a rich environment in which they can develop their vestibular and proprioceptive senses. Overall, I aim for my classes to be a place where the children of a community can experience social, physical and above all, musical development." Choose Day & Time below to register for Teacher Monica's classes.